Newell’s had won the Apertura championship in 1990-91, playing brilliant, vibrant football but, exhausted, they had stuttered badly in the Clausurachampionship and were even worse in the Apertura in 1991-92. In the whole of 1991 they had won only nine of 38 league games. The Clausura had, at least, begun with a 2-0 win over Quilmes but the humiliation against San Lorenzo had set the doubts loose again. After a tearful phone call to his wife, Laura, Bielsa made his decision: he would not abandon his philosophy; he would intensify it. He gathered his players together and explained his vision. Newell’s lost once in clinching the Clausura title and won four and drew three of their seven remaining group games in the Libertadores. They drew San Lorenzo again in the quarter-final and this time beat them 5-1 on aggregate. They got by America de Cali on penalties in the semi-final but, just as a glorious double loomed, they were beaten on penalties in the final by São Paulo. An exhausted Bielsa left for Atlas in Mexico but his point had been proved and his influence remained. 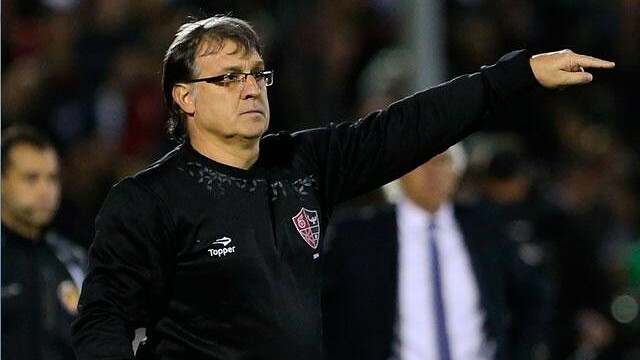 Gerardo ‘Tata’ Martino was a key player in that Newell’s team (which also included the Southampton manager, Mauricio Pochettino). Operating across the front of midfield, he was the side’s main creator but he was also the emotional hub. Martino is not another Bielsa – he is far too pragmatic for that – but he is bielsista, not merely in his football but in his look: he too sports a fluffy demi-mullet and while there may not be a cord on his glasses, he still exudes the air of a bookish academic who cannot quite work out why he is wearing a tracksuit rather than tweed. Martino moved into coaching in 1998 and pursued a peripatetic career. When he returned to Newell’s in 2012, it was his ninth club in 14 years, five of which had been spent with the Paraguay national team. He won three Paraguayan titles across two spells at Libertad and led the national side to the final of the Copa America in 2011. He came back holding his nose, calling Argentinian football “hysterical” and “dirty” and lamenting the physicality of a game in which the result overshadows everything else. Given the way his Paraguay side ground their way through games – they scored three and conceded two in five games (plus one batch of extra time) at the 2010 World Cup, while their last-16 tie against Japan was probably the worst game of the tournament; at the Copa America, after showing some spark in the group stage, they shut out Brazil in the quarter-final, drawing 0-0 and winning on penalties before doing the same to Venezuela in the semi – a complaint about aesthetics seemed a little rich. But he took a Newell’s side that had finished 18th and sixth in the previous season’s Apertura and Clausura and shaped them into a purposeful, attractive team. Perhaps they did not score as many goals as some would have liked but they pressed hard, defended well and passed neatly. And then, like so many bielsista teams, they ran out of steam on the run-in, surrendering the Torneo Inicial to Vélez Sarsfield. But they regrouped and came back refreshed for the Torneo final, winning it by three points and answering criticism of their lack of goals return by racking up 40 in 19 games, 12 more than anybody else. So Martino has a decent, if not spectacular record. He has never coached in Europe and many great South American managers have struggled, at least initially, in trying to make the transition. Past record, though, has rarely been central to Barcelona‘s appointments. Frank Rijkaard’s only club experience had been to relegate Sparta Rotterdam for the only time in their history. Pep Guardiola had had one year in charge of the reserve side. Tito Vilanova had taken Palafrugell to relegation out of the Tercera Division in his only stint as a head coach. Far more important is the philosophy. Martino fits that in as much as he is bielsista. Guardiola, of course, shared an asado with Bielsa to pick his brains before taking the Barcelona job, talking late into the night. Guardiola’s thinking on the game had been shaped mostly, he said, by Louis van Gaal and also by Johan Cruyff. Cruyff and Van Gaal have their differences but the ideal of a hard-pressing, possession-based game, with a 4-3-3 that can become 3-4-3 was common to both. Martino, having played under Bielsa and being, like Bielsa (and like Lionel Messi, which may be significant) from Rosario, is an advocate of the South American equivalent of the same school – although he has used a back three extremely infrequently. Yet Martino is probably less idealistic than Van Gaal, Cruyff or Bielsa. He showed with Paraguay his willingness to adapt his approach and, although Newell’s did finally cut loose in the torneo final, it was only after securing the defence. There is no chance of him making Barcelona a negative side but they are likely to be more cautious than they perhaps have been of late; certainly it is hard to imagine a Martino side capitulating quite so meekly as Barça did to Bayern last season – and throwing away a 2-0 first-leg lead against Atlético Mineiro is only likely to make him more conservative.